Chelsey and Jeremy Bieber’s Romantic Destination WeddingInside a sun-kissed destination wedding in Jamaica. 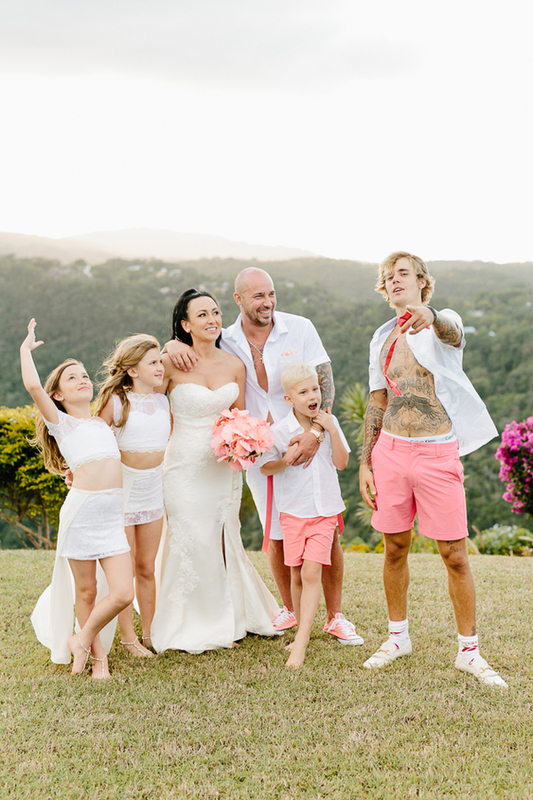 TORONTO, ON, May 16, 2018 /24-7PressRelease/ — Nestled on top of a sun-kissed hill overlooking a dizzying gorge in Jamaica, Toronto’s world-famous wedding photographers Mango Studios have captured the unique moments when Justin Bieber’s famously fiery father Jeremy, finally tied the knot with long-term girlfriend Chelsea Rebelo. And of course, his pop-sensation son turned up, arm in arm with Selena Gomez to share the magical day. Justin was in his groomsman outfit of a white shirt and pink shorts, while Selena wore a pink floral maxi dress to match the theme. Like father like son, both Jeremy and Justin have battled problems with alcohol and drugs, but this day was a genuinely magical moment, with family and close-friends celebrating the union of two people very much in love. And as the sun disappeared behind the stunning Jamaican vista and the night stars started glimmering in the sky, the wedding of newlyweds Jeremy and Chelsea Bieber turned into a “good old family house party,” with the happy couple and loved ones’ dancing well into the night. Mango Studios is a photography studio located in the heart of the city of Toronto, with offices and photographers located throughout the US, Canada, and Miami.Their team, is made up of many talented, professional, and award winning photographers, with a mission to provide their clients with the most affordable and professional wedding and engagement photography in the area.